Painting shadows may tempt the beginner into darkening the colour with black or dark brown. The resultant effect may be a painting that appears to contain solid black pools beneath trees and foliage. The beginner may represent shadows in the same way, making each shadow appear to repeat throughout the painting with a jarring effect, taking the eye from the intended focal point. See my Youtube clip on painting autumn shadows before reading the following tips. 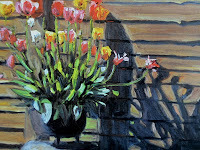 There are lots of opportunities for making shadows more interesting in a painting. A shadow spilling over different contours, such as a brick wall will create a focal point. Dappled shadows on a bright day or lengthening shadows over a lawn in the evening cannot fail to draw the eye. Viewing shadows from unusual angles, such as pointing directly at the viewer will make shadows the focal point within a painting. The following pigments will prove invaluable when painting shadows and can be used as a base colour: burnt sienna, burnt umber, ultramarine blue, permanent rose and white, although other colours will be seen within shadows. A good photographic resource or still life setting with shadows is also invaluable. Keeping it simple is the key for the beginner. But great satisfaction can be sought from painting shadows outdoors from life, in which case, the changing lighting conditions will need to be taken into account. It is advisable to paint the shadow element of a painting simultaneously, before they shift direction too much.